The other week I was invited to a press screening of the new Disney Pixar film, Ratatouille, which is due to be released in the UK on 12th October. 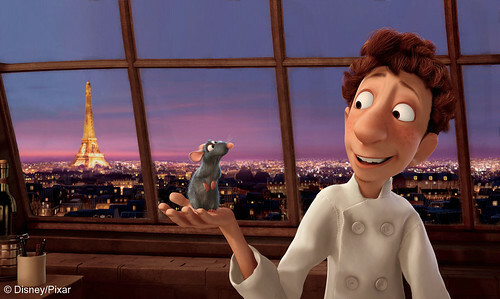 Ratatouille follows the story of Remy, a rat with a refined palate and an unlikely dream – to become a chef. Remy finds himself on an adventure that takes him to the heart of Paris and to the kitchen of the most famous 5-star restaurant in the city, where he teams up with Linguini the garbage boy and together they create dishes that dazzle and delight. 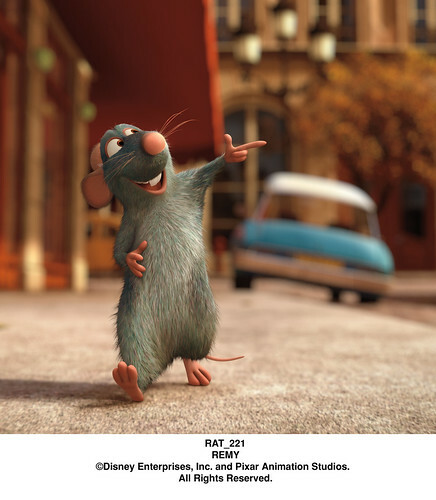 The film has everything you’d expect from Disney Pixar – lovable characters; fantastic animation; warmth; fun and adventure, along with an exploration of emotions and values as Remy is torn between his family and following his dream, giving real meaning to the story. 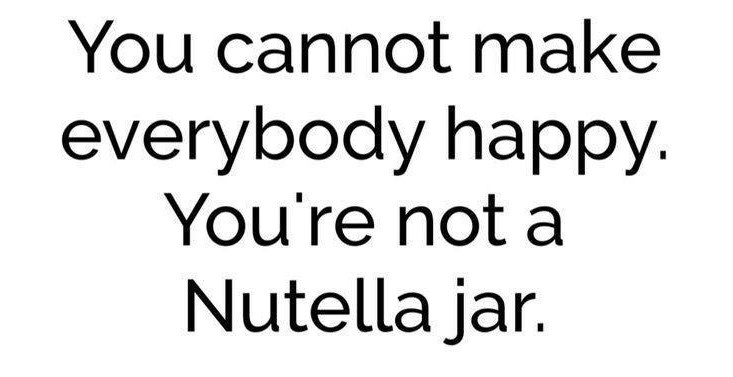 The characters are full of life, robust and memorable. They include the punchy Colette, the sole female chef of the kitchen who gives as good, if not better, than the guys; Auguste Gusteau, the deceased-yet-cheery restaurant owner who becomes Remy’s guide; the somewhat goofy Linguini and the dark and dusty restaurant critic, Anton Ego, ‘The Grim Eater’. Now, to the food. The film makers spent a huge amount of effort in bringing gourmet food and the workings of a professional kitchen to the big screen. They consulted with the highly acclaimed chef and owner of The French Laundry, Thomas Keller, on French Cuisine, they took cooking classes where they learned knife techniques and they visited the kitchens of restaurants in Paris. The film’s director, Brad Bird, even spent two days on an internship at The French Laundry in order to see how a restaurant kitchen really works. Thomas Keller explained “Brad wanted to see what a real kitchen looks and feels like, the energy, the dynamic, how people work together and move around the kitchen – “the dance” as we call it in our restaurant”. Clearly it paid off, as Brad certainly managed to create that movement and energy in the kitchen scenes of the film. Of course the real challenge with making an animated film about food is with making it life-like and edible-looking. As supervising technical director, Michael Fong, said “The only way to recreate what the dishes look like when the sauces are bubbling and the steam is rising off them was to actually cook the dishes on a real stove and then photograph them”. The efforts of the film makers have resulted in enthralling kitchen scenes and stunning looking food, probably the best seen in animation yet. Ratatouille is sure to be a big hit with food-lovers everywhere.